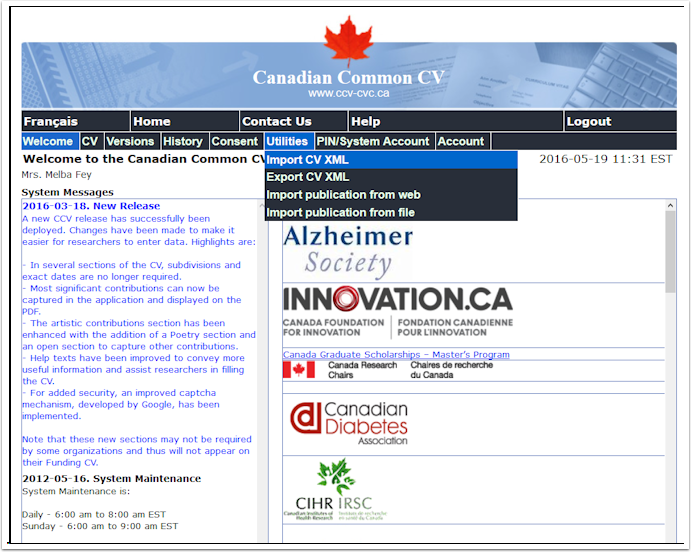 The Canadian Common Vita (CCV) utilizes a complex XML file format for exchanging data with external systems, such as FACULTY180. In order for FACULTY180 to communicate with the CCV, it must be able to properly read and write into the XML file format. Certain elements of this XML file contain unique identifiers for each user's account, and thus each user’s XML exchange file is unique. Enforcing importing data prior to exporting data guarantees that the user has a CCV account already pre-established. 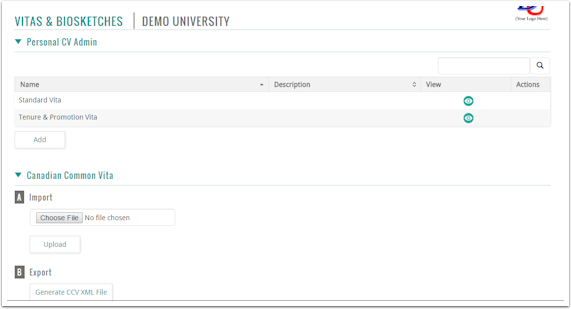 FACULTY180 must know the proper identifiers and structure for a user’s CCV account, and this can only be done if the user first imports a valid CCV XML file into FACULTY180 before attempting to export back to the CCV. When the CCV imports data, it overwrites all records for any imported sections. Therefore, it is critical, if the faculty member is not to lose data already existing within the CCV, that data be imported into FACULTY180 before attempting to export data back to the CCV. These requirements are not imposed by Interfolio but rather by the CCV itself and the nature of the transfer functionality built into it. In the Canadian Common Vita section, click Choose File. Select the file to be uploaded, then click Upload. Faculty members can view the most recent CCV that was imported into FACULTY180 by clicking View Previous CCV Import. The CCV can then be printed, if necessary, using the available printing options in the browser. In the Canadian Common Vita section, click Generate CCV XML File.